Lirael is no longer a shy Second Assistant Librarian. She is the Abhorsen-in-Waiting, and she has the Dead to battle and Free Magic creatures to bind. When Lirael saves Nicholas Sayre from an attack by a Free Magic creature she finds he is tainted with Free Magic and she must return to her childhood home at the Clayr’s Glacier for guidance. But Lireal is unaware that a great danger threatens the Old Kingdom. A messenger from the North is trying to reach to give her a warning about the Witch With No Face, but who is the Witch and what is her plan? This time the fight may rage both in the living world and in the remorseless river of Death. As this is a sequel, there may be some vague spoilers for the rest of the Old Kingdom series, Abhorsen especially, but I’ll try to keep them to a minimum. Goldenhand is brilliant. It continues a few months after the events of Abhorsen and while it is mostly Lirael’s story, it’s great to see how she is fitting in with her new found family and what they are all up to now as well. Sam continues to be slightly oblivious to things that aren’t to do with inventing things but he’s still very smart and capable. In Goldenhand you really see how much Lirael has grown and become more confident but she still gets scared and she’s still mourning her oldest friend which I’m pleased was not something that was easily pushed aside. The story alternates between what Lirael is doing and what Ferin, the messenger from the North is going through. Ferin is a wonderful new character who is strong and resourceful and never gives up. She is a fighter who doesn’t mince her words and she’s nothing like any of the other female characters that have appeared in this series so far. It was nice to have Nicholas return, especially as he is a bit of a fish out of water in the Old Kingdom. If you’ve read the series, you as the reader are quite familiar with the world and its ways so it’s nice to see an outsiders’ perspective. Also his and Lirael’s relationship was lovely as the hesitantly try to figure out where they stand and Lirael tries to figure out her feelings in general because even having a friend is something she’s very much not used to. Goldenhand is a fast-paced book, full of action and suspense and there’s the kind of scary moments when it comes to the Dead. In this book there’s Free Magic creatures you’ve never seen before and shows a whole part of the world that hasn’t really been explored before either. 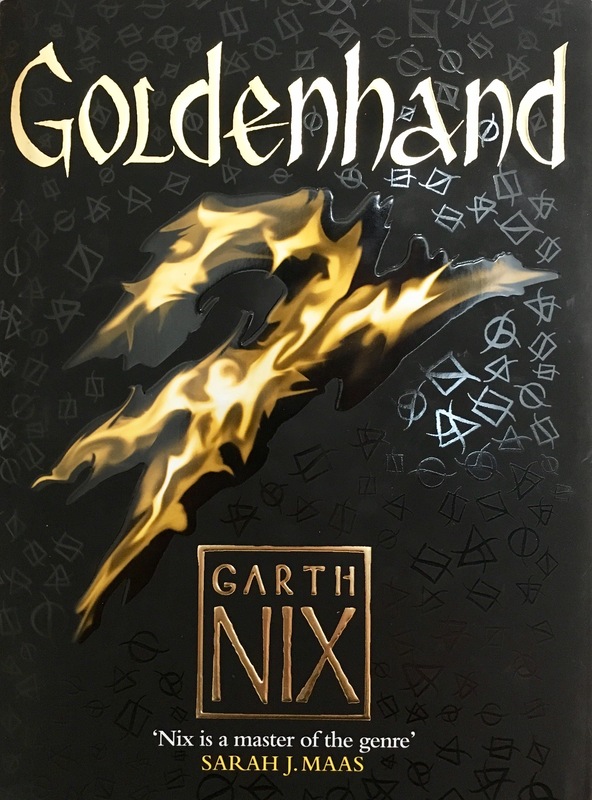 While the majority of the characters, and the stakes, are familiar that doesn’t really matter as Goldenhand is such an enjoyable thrill-ride and it even makes the bad guys interesting. Goldenhand is a perfect addition to the Old Kingdom series and is a super fast-paced read with some wonderful character moments. 5/5.